It’s Mosaic Monday again. I posted these new photos that I took in my garden yesterday for Mosaic Monday I have 12 of them.
. The first photo is that of a clematis that is my neighbor’s donation to my garden. It is climbing over the fence from his yard tomorrow and I think it is beautiful.
. The second is my orange crocosmia. I really like this little one. It is not as large as my giant Lucifer crocosmia, but it is a great addition to my garden.
. Next comes my caryopteris, which just started blooming. This is one of my favor favorite late-summer shrubs. 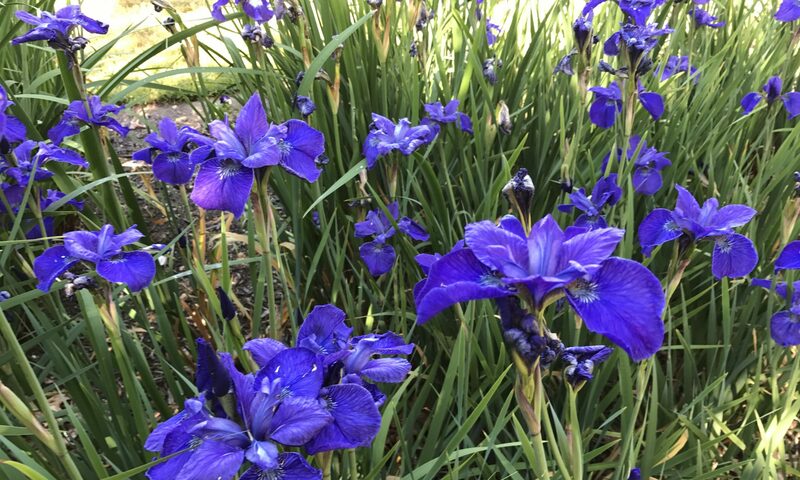 It comes in with these waves of beautiful blue blooms, and maybe you can see the bumblebee on it.
. This little yellow flower is a volunteer I almost pulled out as a weed. Now I believe this is a volunteer wallflower.
. Next comes the liatrice in my volcano strip with it’s perky purple blooms.
. And one of the fuchias I bought this spring.
. Coming next is nearly the last gasp of my daylilies this pink beauty is really peach color and is just outside my living room window.
. We also have the orange one on the bottom row.
. One of my favorite roses, Gourmet Popcorn, is giving another flush of bloom.
. My Japanese anemones are just starting to bloom. I love them I have several in front and in back.
. Next comes my pole beans. I couldn’t resist filming us.
. And last, is a golden rod that volunteered in my garden. I can’t believe. Goldenrod is a beautiful flower that I can hardly believe they now sell as cultivars. When I grew up in the Midwest, it was considered a weed and the bane of my mother’s summer allergies. I love it and I think it’s beautiful. Oh and did I say this was a volunteer. And that’s all there is for me for right now for Mosaic Monday. I hope you enjoy my blooming garden. Also, you can take a look at some other beautiful mosaics by other gardeners at Little Red House. Thanks Mindy. Fragrant 4 o’clocks…the more that is fragrant the better. My most fragrant flower right now, other than roses, are the phlox and my tall, white nicotiana. We purchased nicotiana seeds from Montecello, and they said that that variety had been in Thomas Jefferson’s garden. This year we only have two of them growing, in other years there have been many more, and are they fragrant. What a lovely garden you have. Love the mosaic of your blooms.